Laser vision correction did not first begin with LASIK but began as a surface-based procedure known as earlyPRK in 1992. Since then, the surface based procedure has evolved and improved through the years as a result of medical advancements. Today, laser vision procedures that are surface based are collectively grouped and given the scientific name of Advanced Surface Ablation (ASA). Below is a timeline showing the progress of ASA. The first vision correction procedure introduced in 1992. Using a blunt blade to scrape the cornea surface cells to expose the underlying cornea tissue. Before an excimer laser is used to reshape the exposed cornea surface. A downfall was that the procedure tends to overheat the cornea surface and recovery was slow and painful. The first laser vision correction procedure PRK was done way back in 1987. We have come a long way since then. After many stages of evolution from its PRK, Advanced PRK, LASEK and epiLASIK predecessors, transPRK epiLASIK has emerged as the newest and most advanced form of the ASA method of laser vision correction. After more than 25 years of evolution, I believe that we are finally approaching the ideal laser vision correction procedure with the newly evolved transPRK epiLASIK! The new transPRK epiLASIK is a true all laser, one-step and no touch method of laser vision correction. Using a LASEK ring to hold open the eye, a 20% alcohol solution is poured onto the cornea surface for 20 seconds. Removing the epithelium cells. 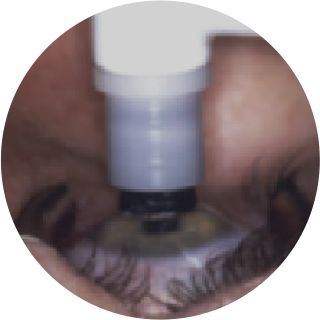 Excimer laser ablation is then carried out and a bandaged contact lens is placed over the eye. Removal of epithelium cells is done using a high-speed vibration epithelium separator. This does not cut your cornea but instead shakes away the surface epithelium cells with its high-speed vibration. An improvement from epiLASIK and currently the frontier of ASA techniques, TransPRK uses only a single laser throughout the entire surgery. The single laser removes the epithelium cells and then goes on to reshape the cornea tissue. All done in one fast and seamless step.